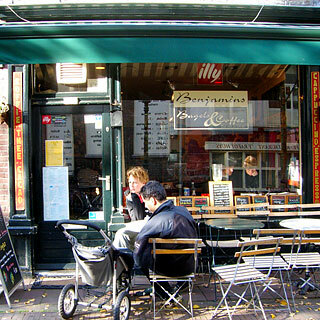 Delft is a small student town with a high-cafe factor. Unfortunately, it has a high tourist-factor too, which creates a market that supports crap cafes, but this problem is mitigated by the many tiny streets where good small cafes can hide from the crowds. Recommendation: go for an evening’s drinking. While Locus Publicus ups the stakes with its fiendish beer selection, this place’s serious respect for jazz makes it special. It is no slouch when it comes to the beer selection, though, with four guest beers. The low beams and half-hidden sidestreet location give this bar an intimate feel, along with the obviously local crowd. This is the kind of place where you apsire to merely ordering ‘the usual’. 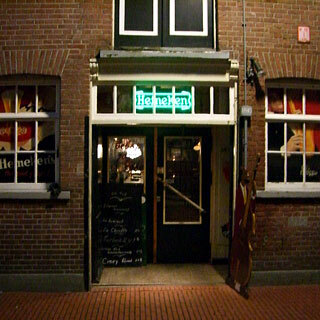 Apart from the jazz-induced dinginess, the interior is full-on classic Dutch pub style, with lots of wood and a marble bar, and a friendly barman. Benjamins Bagels & Coffee is a tiny old-style cafe that has an impressive menu of about 70 bagel or sandwich options, ranging from basics like cream cheese (€2.20), cold meat or eggs to elaborate student-style combinations such as the ‘autumn special’ with chilli-beef, bacon and cheese (€4.80). However, except for classics like the smoked salmon with cream cheese and capers (€3.60) and the ‘Italian’ with salami, mozzarella and pesto (€3.60), the options remain as unsophisticated as the decor, with the likes of kroket and hamburger sandwiches. The mellow music and cramped furniture make this a cosy place to sit around and chat over lunch. The decor combines veneer tables, wood panelling and opposite walls with collages of photos and local ents. posters, respectively. 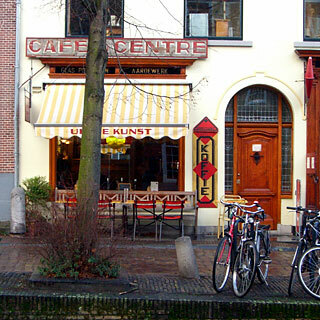 When we went back in November, the cafe was temporarily closed, to open under new management on 4 December 2007. With luck, Anka and Bram, who take over, will not chnage the good things about the place too much. 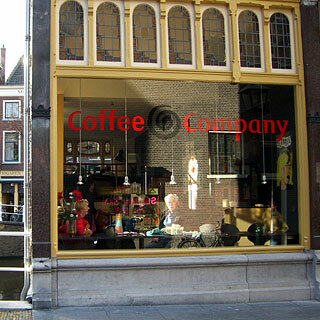 Coffee Company is the kind of North-American-style cafe that you do not see much in South-Holland. The disadvantages of a chain aside, this one is serious enough to have taken a brilliant location on the corner of two canals and made a huge split-level cafe with a lot of space, numerous leather armchairs and the all-important sofas. The interior and its design are spacious, light and minimal, with high ceilings, big windows and carefully-contrasted shades of charcoal, white and beige. This is accompanied by the inevitable easy-listening jazz and blues. Also, a welcome distinction: this is a non-smoking cafe. Recommendation: try every draught beer you have not had before, then work your way through the rest. 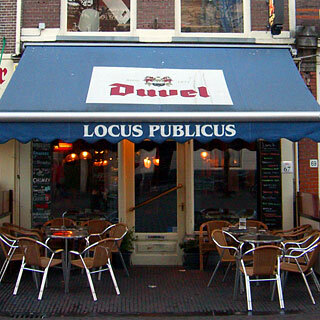 Locus Publicus is the best kind of Dutch pub: small and crowded with lots of dark brown veneer panelling, ineffective lighting and well-worn furniture. Like its namesake in Rotterdam, this cafe takes things up a level by having ten beers on tap, including at least a couple of obscure guest beers alongside the regulars, and a very large selection of bottled beers. Our last late-afternoon visit found us in a crowded bar, accompanied by classic rock: all beer, chatter and guitar solos. 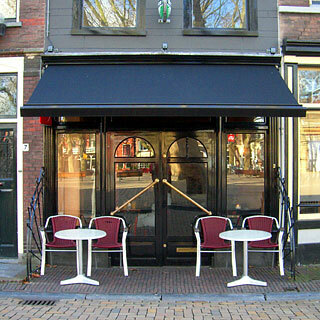 De Smoezer is a very small and unusual cafe in that it is more like a mediterranean bar, with a tiled floor and bare walls, and the whole place being standing room around the bar. It is actually a decent place for a daytime coffee or drink too, if there is room to sit at one of the three tables inside, or on the tiny terrace in the summer. The atmosphere is mostly set by the music, which was gentle electronic and lounge when we visited. There is also an unexpectedly varied menu, with salads and sandwiches, and a couple of pasta dishes, and a couple of pasta dishes (until 9 pm) and bar snacks (until midnight). Uit de Kunst is an unusual place that puts a collection of several decades’ worth of bric-a-brac into a cluttered cafe with more objets d’art and retro memorabilia than you can shake an art-deco candlestick at. All of this works surprisingly well, and makes for an interesting place to sit around drinking coffee. There is a lunch menu that features a broad and appropriately creative and artistically-named sandwiches, as well as assorted other snacks, salads and cake. The glass of water and biscuit that came with the coffee are a good sign, so we look forward to going back for lunch. 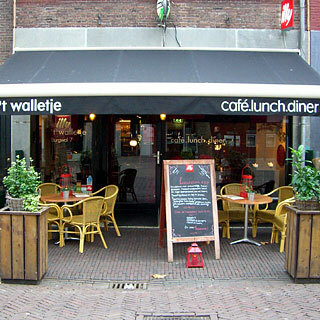 ’t Walletje is an unusually special cafe-restaurant that combines a relaxed old-style environment with good service and an excellent menu. Drawn in by the lure of Illy coffee and the cosy looks, we were delighted to find big round tables with a varied mix of comfortable bistro chairs, wood panelling, atmospheric lighting and random nautically-themed decor all combining to make a warm informal feel, with classy finishing touches such as the rose in a vase on each table. The menu has a fairly broad selection of lunch and dinner options. For lunch we had the excellent Lunch Plank (€9.95), which provides a generous and delicious selection of bread with ham, cheese, smoked salmon, cream cheese and jam fillings and soup on the side. Otherwise, the lunch menu features plenty of salad, sandwich and egg dishes.